There is a verified problem with Harley-Davidson Big Twin compensating sprockets. The compensating sprocket buffers torque from the engine and the limitations with this part may be most obvious in newer, big bore engines. A part that was adequate in an 82-cubic-inch engine may not be adequate in a 103-cubic-inch engine. Harley has not issued a recall. The company is, however, selling a reinforced compensator replacement kit, part number 40274-08. The symptoms of a bad compensator are a loud clang at start up, trouble shifting into first or neutral and a sound like gravel in the front of the primary around 2200 RPM. But, the only way to know for sure that you have this problem is to pull the primary cover off and look. Remove the primary chain case drain plug on the bottom of the chain case under the clutch cover with an Allen socket and a socket wrench. Drain the primary chain case fluid into a pan. Inspect the magnetic end of the drain plug for bits of metal. Dredge the drained primary chain case fluid with a magnetic probe. Inspect the probe for bits of metal. Remove the five clutch cover screws with an Allen or Torx socket (depending on the year and model of your bike) and a socket wrench. Remove the round clutch cover and gasket. Discard the gasket. Remove all four screws in the oval inspection cover with an Allen or Torx socket and a socket wrench. Remove the cover and gasket. Discard the gasket. Remove all 12 primary chain case cover screws with an Allen or Torx socket and a socket wrench. Remove the primary chain case cover. Remove and discard the primary chain case cover gasket and both primary chain case tower gaskets inside the primary. Inspect the compensating sprocket, the clutch, the chain and the chain tensioner for obvious defects or wear. Heat the compensating sprocket nut with a heat gun to loosen the nut. Remove the compensating sprocket nut with a hex socket and a breaker bar. Remove the spacer, sprocket cover, sliding cam and compensating sprocket. Clean and inspect all components for wear. Replace or repair as needed. 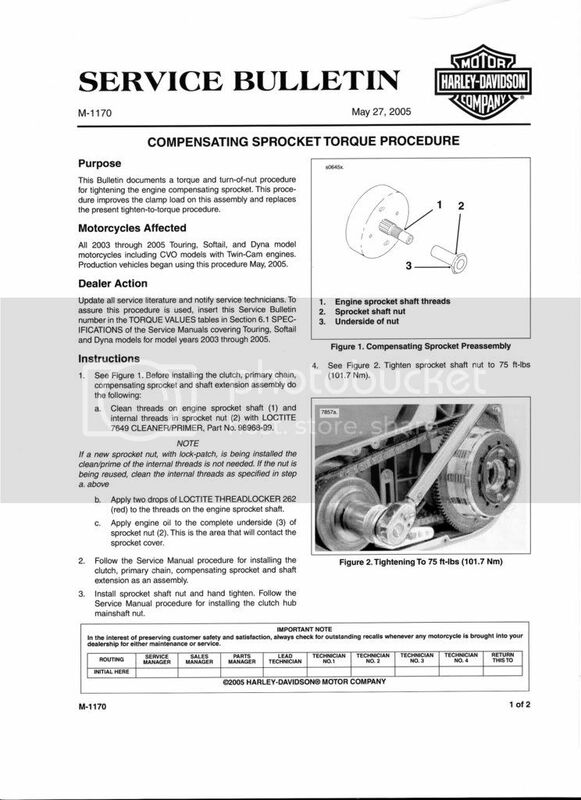 Inspect the shaft extension for wear before beginning reassembly. Clean the threads on the engine sprocket shaft and the internal threads in the sprocket nut with Loctite 7649 cleaner/primer or equivalent. Apply thread locker to the threads on the engine sprocket shaft. Apply engine oil to the underside of the sprocket nut. Replace the compensating sprocket, sliding cam, sprocket cover and spacer. Hand tighten the sprocket nut. Tighten the sprocket nut to 75 foot-pounds of torque with a hex socket and a torque wrench. Install two new tower gaskets and a new primary chain case cover gasket. Replace the primary chain case cover. Tighten the primary cover screws to 120 inch-pounds of torque with a Torx or Allen socket and a torque wrench in the exact tightening sequence described in the service manual for your motorcycle. Pour primary chain case lubricant into the primary chain case until the lubricant just touches the bottom of the clutch. Replace the clutch cover with a new clutch cover gasket. Check for leaks. Road test the motorcycle.